The Irish are passionate about both sports and gambling. These mobile sports betting apps allow you to wager on GAA football, hurling, soccer, horse racing and rugby using any iOS or Android device in the Republic. ﻿Sport is an essential part of Irish life. Whether it is local communities cheering on their home county in a Gaelic football match, or a sea of tricolours getting behind UFC fighter Connor McGregor on the worldwide stage in Las Vegas, the atmosphere, comradeship and pride displayed, is simply not found among another people. In addition to their success in rugby, golf and boxing, Ireland has a great passion for football and greyhound racing. The country has also produced many top quality National Hunt and Flat horses, as well as world-class trainers and jockeys such as Barry Geraghty and Ruby Walsh. Both Rory McIlroy and Padraig Harrington play for the Irish golf team. No Irish man is ever afraid to put his money where his mouth is, so Irelands bookmakers have been very profitable over the years. With modern mobile phones and tablets, punters now have access to a wealth of information and the flexibility to bet wherever they are. Here you can find out all about some of the best Irish sports betting apps available. Since its formation in 1998, by merging a group of independent bookmakers, Paddy Power has quickly become the dominant name in Irish sports betting. Famous for their controversial publicity campaigns, Paddy Power provides the best deals for Irish punters, including some great money back specials, as well as being an innovator in online services and mobile apps. ​Android owners can download the Paddy Power sports app directly from the website, while iOS users also have the option to get it from the Apple Store. When you open it up the app is decorated in Paddy Power's green colours and displays banners showing the latest offers. The rest of the front page shows the current In-Play, live betting markets, along with upcoming events like football matches and horse races. Popular markets such as golf, tennis and greyhound racing can be accessed through a series of icons running across the top of the page, or you can find a full list of sports under the menu. Here you can find everything from hurling to table tennis, along with a wide selection of novelty bets on everything from the X-factor to Podge & Rodge hosting the Late Late Show. Since it began in Belfast, during the 1920s, greyhound racing has remained a popular spectator and betting sport throughout Ireland. Now even the casual race-goer can get all the news and information they need on Irish greyhound racing, thanks to the Barking Buzz app from the Irish Greyhound Board. 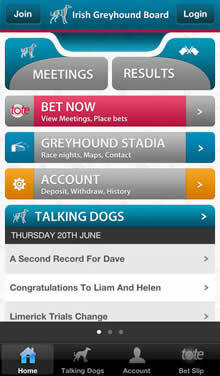 The betting app covers all major Irish dog tracks, including Shelbourne Park, Harolds Cross and Limerick racetrack. This app is currently only available on iOS and Android devices, and can be downloaded either through the Apple store or directly from IGB's website. Once downloaded the app will let you check out all the days meetings, along with details of the various venues. You can also pull up the various cards for the day, check out the form and stats, and even run a simulation of each race using the predictor tool. If you want to place a bet on a dog race, Barking Buzz can do this for you using the Tote. Simply register you account through the app, deposit your funds, and you can make your selections there and then. When you have placed your bets, they are added in with the Tote pools and your winnings are paid back into your account once the race is completed. Every day, Barking Buzz shows many live races from various tracks. These can be viewed on your device in HD quality live streams. All the meetings which are being shown that day are marked with a TV icon, and to access the stream, all you have to do is wager €1 through the app. Then you can sit back and enjoy the racing, no matter where you are. ﻿While you can find several betting apps which allow you to watch live sport, not all of them cater for Irish sport. Instead of relying on the different sportsbooks to provide you with the games you want, here are some options to watch live streaming sports from Ireland. GAAGO - This app streams all the top Gaelic Games to audiences outside of Ireland. The service is a joint venture between the GAA and RTE, and allows you to watch all the Hurling and Gaelic Football events shown on RTE 2, TG4, Setanata Sports and Sky Sports. This service does charge and you will need to either buy a season pass, or pay for individual matches, although once brought you can watch the stream on your mobile device, desktop computer or smart TV. RTE Player - RTE is Ireland's national broadcaster. Their replayer app is available for all mobile devices, or you can watch programs via the main website. Here you can find many a variety of GAA sports, horse racing, rugby and boxing . You can also find some soccer matches and major golf tournaments. While RTE does provide a mostly free service, there are charges for certain events. UK Live Streaming Apps - As the UK's main broadcaster, the BBC screen many free events through the BBC iPlayer and BBC Sports apps that have an Irish interest. These include competitions, such as rugby union's Six Nations, golf and international athletics. For UK horse racing, Channel 4's All4 app streams a meeting every Saturday, and covers large meetings such as Cheltenham and Ascot. Finally for the best Premier League football action, along with a wide catalogue of sports, Sky Sports Mobile TV hosts a huge collection of streams. The app does require that you have a Sky Sports subscription however, or that you purchase the events you want to watch. ﻿Every country has different rules and regulations governing online gambling. In this FAQ we will try to answer some of the most common questions from an Irish perspective. Is gambling legal in Ireland? Yes, sports betting and other forms of gambling such as poker, lotteries and casino gaming are all legal in both Northern Ireland and the Republic Of Ireland. Is there an online gambling tax in Ireland? Yes. Following the enactment of the Betting (Amendment) Bill 2013 all betting exchanges and bookmakers doing business in Ireland need to pay a gambling tax regardless of where they are located. Can I download sports betting apps from the Irish iTunes App Store? Yes. Since all forms of online and mobile betting are legal in Ireland, iPhone, iPad and Apple Watch owners are free to download mobile sportsbook apps from the iOS App Store. Can I use PayPal to fund my Irish betting account? Yes. If you are a citizen of the Republic of Ireland you can deposit money to most mobile bookmakers using PayPal.